7/23/2014 - TYNDALL AIR FORCE BASE, Fla. -- It's been described as a 200-gallon cow's stomach and for Air Force Academy cadet, Marcus Penner, it's been a big part of his summer break. 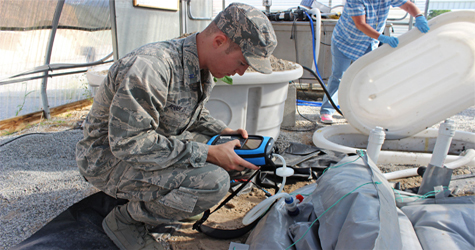 For six weeks, Penner, a biology major and soon-to-be senior at the Air Force Academy in Colorado Springs, Colo., worked alongside scientists at the Air Force Civil Engineer Center's Readiness Directorate at Tyndall. The goal was to turn food waste into methane gas using an anaerobic digester. Methane can potentially be burned for heat or to generate electricity at expeditionary bases. "One of the biggest challenges right now at deployed locations is getting rid of waste," said Robert Diltz, a requirements engineer with AFCEC's Readiness Directorate. "Whether it's solid, liquid or sewage waste, it's expensive, hazardous and time-consuming to dispose of. We're looking for ways to eliminate that." Working with AFCEC scientists, Penner set up and tested a 200-gallon bag digester constructed from thick vinyl and partially buried to regulate its internal temperature. The digester uses bacteria in a low oxygen environment to break down the waste. As the bacteria feed, they produce methane gas. "We achieved more than 44 percent methane which is what we're shooting for," said Penner. "That's very successful compared to other tests we've run with a methane yield only in the teens. This digester is also outputting very low oxygen levels, which is good. It's working pretty well." The system relies on two different bacteria working together to produce methane. "There is the acidogenic bacteria, which eat these organic compounds and break them down to smaller organic acids," Penner explained. "Then, the methanogen eat the smaller acids and produce methane gas." One of the challenges the team faced was to make sure the digester maintained a healthy balance between the two bacteria. They took regular samples to measure the pH levels and the temperature, as well as determine the amount of solids left after the digestion process. Each day, Penner prepared a mixture of blended food to add to the digester through the bag's input valve. It was a messy process which caused the pressurized system to expel sludge, called digestate, into a large collection vat. "The digestate can be dried and used for fertilizer." said Penner. "It's an additional benefit besides the methane production and waste removal." During the project, Penner worked with Tyndall's commissary, base restaurants and the Silver Flag Exercise Site to identify and collect the types of food waste that would be typical at an installation or in a contingency environment. Earlier this month, Penner presented the results of his research project to AFCEC members. He recommends larger scale testing to more closely simulate the waste generated at a contingency location. AFCEC plans to continue testing different types of digesters and address ways to pre-package and ship the inoculate material that could be used to jump start anaerobic digestion systems at deployed bases. Research partnerships like this not only benefit their work, but the entire Air Force as well, said Diltz. "It gives us a chance to get some new perspective and ideas into what we're doing here," Diltz said. "It also enables the cadets to see some of the real world problems and challenges, and the solutions that are being approached to solve these things." "That's one of the reasons I came here, because this project was noted as having the most effect downrange," said Penner. "Doing a lot of work and seeing something come out of it. That's what interested me. It's been really exciting."